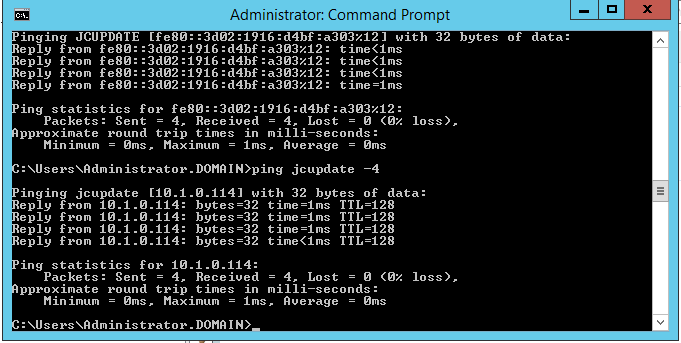 I got onto this server that, when I did a ping to another server, would only return an IPv6 address. I mean, I had the server name, but to do what I needed, I just needed the IPv4 address, and not the IPv6 address. Since I didn't know what to make of it, I needed to find a way to get it to respond with the IPv4 address. So, here is what I did. I added the "-4" option behind my ping statement. See below. The name of the server I want to ping is "jcupdate". If you look at the top, you will see where the IPv6 response came. Then I ran the "ping jcupdate -4" to get what I was looking for. Now that's cool...learn something new everyday!! Yeah, that was a first for me.